Bring the expertise of America's foremost authority on contracts into your practice with this comprehensive three-volume set. Farnsworth on Contracts, Fourth Edition is where doctrine meets practice. Now in loose-leaf format, this ultimate guide to contracts is designed to increase readability and usefulness for practitioners while providing the most up-to-date content. In the years since the prior edition, contracts law has developed in both anticipated and surprising ways. Arbitration agreements became even more common, and the Supreme Court upended a significant body of state caselaw regarding their enforceability. Online contracting became more common and more complex. Courts were joined by legislators and administrative agencies in setting new limits on contracts. Accordingly, the previous edition had been supplemented with authorities confirming the doctrines described in the prose, building nuances onto them, and questioning or completely departing from them. The new edition retains most of the earlier supplemental material and overall structure of the book, but reorganizes the content to present changes in the law more clearly and to collect all relevant material in areas that are seeing the most litigation. It also moves to a looseleaf format, so future developments can be incorporated seamlessly and accessed efficiently. Farnsworth illustrates how contemporary contract law has been shaped by both the Restatement (Second) of Contracts -- for which he served as Reporter -- and the Uniform Commercial Code. Easy access to specifics, new cases, new drafting tips, new references, and timesaving features like cross-referenced cases and marginal headings make this three-volume set a valuable resource for contracts research and practice, including litigation and arbitration. 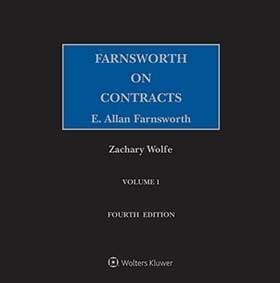 Farnsworth on Contracts, Fourth Edition is the most authoritative contracts treatise available.